Thanks for the opportunity to show you an unforgettable day on the Caribbean Sea! Please see below all the details of the tour, as well as available add-ons. 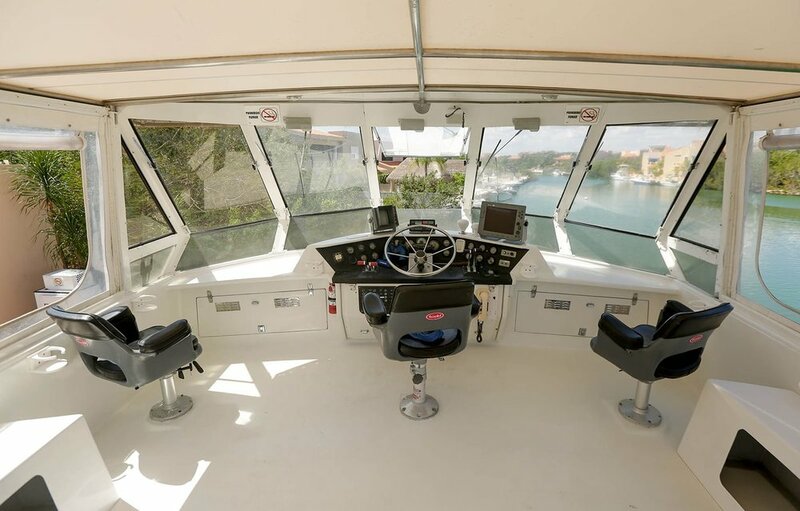 The Piratas de Tejas (Pirates of Texas) is a 72' custom built motor-yacht with room for around 80 guests. She has 5 deck levels that provide excellent viewing for all our guests. There are 2 bathrooms with showers, one exterior freshwater shower, a large interior salon, and air conditioned cabins available for emergencies or young children. Professional grade fishing gear is on board for group fishing activities. 12 volt, USB, and 110 volt outlets are available for charging phones and cameras. She is equipped with a full size kitchen and commercial equipment for our private tours requiring chef services. The Piratas de Tejas is an awesome tour boat with lots of extras normally not available on this type of tour. National open bar (Captain Morgan rum, Jose Cuervo tequila, Cueva vodka, Mexican brand beer. And cocktails are rum punch, daiquiris and margaritas, plus your standard high balls, soda water, coke, diet coke, sprite, fanta, and some juices - cranberry, orange, and pineapple). Take a quick read, it'll be painless, we promise. We understand that life happens and we can’t always do what we want, which is why we allow cancellations for tours with at least two weeks advance notice (14 days from the departure date). If the conditions are unsuitable or unsafe for a day at sea we offer a full refund, no questions asked. Our whole goal is to make sure you have the best day possible on the water.